As you drive through Marysville on I-5, it might be easy to overlook the little steel bridge just to the east, spanning the Ebey Slough on State Route 529. But if you’re stuck in seemingly never-ending freeway traffic, that little bridge can become a driver’s best friend. Built in 1925, the swing-span bridge across the Ebey Slough gives local drivers the option to avoid I-5 congestion as they travel between Everett and Marysville. Back in its heyday, however, the span was one of the few options for crossing the Ebey Slough. At the time, the bridge was the pinnacle of then-modern technology. It could pivot open at its center to allow tall boats to pass, then swing closed to allow traffic across. One 11-foot-wide lane in each direction gave drivers ample room, and a three-foot sidewalk gave bicyclists and pedestrians space to cross, too. Fast-forward 86 years, and that once-modern bridge now seems narrow – unsuited for today’s wider vehicles – with not enough room for pedestrians and cyclists to pass. And frequent openings for marine vessels can put a serious hitch in drivers’ daily commutes. Fortunately, a solution is on the way. Last year, crews began work on a replacement Ebey Slough Bridge – this time taller, wider, and built out of sturdy steel girders with a concrete roadway. Standing 13 feet taller than the old bridge, the new span won’t need to open for marine traffic. And with two 12-foot driving lanes in each direction, plus two six-foot sidewalks and two five-foot bike lanes, there’s plenty of room for all types of commuters. This month marks a major milestone for construction crews as they begin setting 49 girders, each weighing in at approximately 31 tons. It’s more visible work for drivers, too. Most of the work completed since last year has been fairly innocuous: Crews have built temporary work platforms above the slough, drilled deep holes for steel and concrete pilings, and prepared the support structure for the steel girders. Now that the girders are in place, the new bridge is really beginning to take shape – literally. For the first time, the new 680-foot span is beginning to look like a bridge, not just a forest of concrete pillars. Placing each of the girders – which stand seven feet tall and range in length from 100 to 135 feet – is a time-consuming process. Two cranes pluck a girder from the work platform, carefully guide it into position, and then gently swing it into place atop the concrete pilings. The crews typically set 3 girders per day, and expect to wrap up placement of all the girders by the end of June. By April 2012, drivers who have patiently (or not-so-patiently) been watching the new bridge take shape will finally get a chance to drive on the span. Crews plan to open the bridge to northbound traffic in April; southbound traffic will have to wait to use the new span until August, as crews wrap up work in those lanes. Once all traffic is on the new bridge, crews will demolish the old steel span. Traffic that once ground to a standstill as 131,000 vehicles drove through Pierce County will run freely Sunday, June 26, when the SR 16/I-5 Westbound Nalley Valley Viaduct opens to motorists in Tacoma. For those driving anywhere from I-5 to anywhere from Gig Harbor and Gorst to Poulsbo and Port Townsend this is welcome news. The new viaduct improves flows – removing a bottleneck and weave from the interchange completely – and reduces the potential for collisions for drivers. Between 2005 and 2009, an average of 26 collisions occurred at the weave annually. This number is projected to decline considerably as a result of the new construction. This is a great thing, especially for those who not-so-fondly remember heading north on I-5 to the Bremerton exit, running into to a ridiculous wedge that attempted to cram three lanes of traffic down to a single lane, and then immediately upon entering westbound SR 16 had these same drivers trying to weave into oncoming traffic also headed westbound on SR 16 from southbound I-5. As motorists attempted to either get on mainline 16 or take the Sprague Avenue exit, what followed was a poorly choreographed ballet that featured frantic cut-offs, brake lights and applause in the form of honking horns. A mess really. That’s all coming to an end, though. And this was definitely reason for WSDOT to honk its own horn. 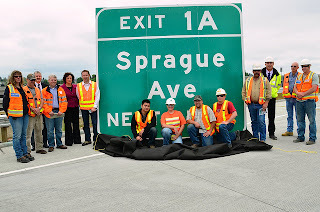 About 50 people, including federal, state and city representative gathered on Sprague off-ramp Wednesday, June 22 to mark the occasion. The $139 million viaduct was $14 million under budget and completed several months ahead of schedule. 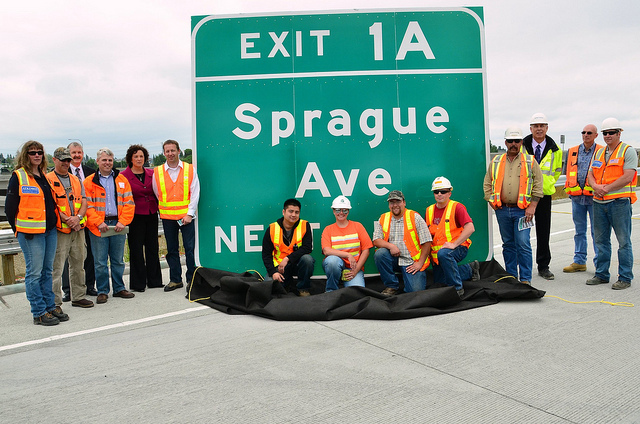 Crews built 10 new bridges – including a segmental overpass connecting northbound I-5 to westbound SR 16 – since Guy F. Atkinson Construction started the $120 million, nickel-funded project in January 2009. The bridges, constructed from new approaches on 77 piers, span more than 7 acres. It was a massive project, but it is just the beginning in terms of coming improvements for Tacoma traffic. The work supports construction of the Eastbound Nalley Valley Project, which begins this fall and in 2013 will move eastbound SR 16 traffic onto a new viaduct structure, and open a new ramp between S. Sprague Avenue and eastbound SR 16. In 2020-2022, WSDOT returns to SR 16/I-5 to add HOV lanes, completing the overall project and helping the agency move Washington even more safely, quickly and efficiently. It might seem like a ways off, and it is, but for anyone who has ever witnessed the SR 16/I-5 ballet in full swing, it’ll be worth the wait. It was during a hot summer (remember those) that our Snow and Ice Materials Contract Team started researching companies that sold snow and ice-fighting materials such as salt and liquid deicers. The team also considered how we could modify restrictive contract language to attract new bidders, and possibly save the state money. This effort proved an overwhelming success. Updating the snow and ice materials contract and attracting additional bidders saved Washington close to $6 million in the first two years. As an added bonus, the contact also passed on savings to local government, Washington’s cities and counties. Using the state’s new contract, cities and counties were able to buy lower cost snow and ice-fighting materials. 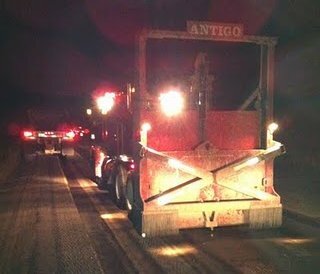 And, while saving money was a great benefit, it wasn’t the only way the team “saved.” They also secured a much more reliable salt supply, making sure snow and ice-fighting materials are always available to keep drivers and the economy moving. Over the following spring and summer, Monty and his team researched salt and deicer suppliers, vendors and shipping alternatives to see how to reduce our costs for snow and ice fighting materials, plus secure a reliable source, regardless of weather. In coordination with the state’s General Administration Contract Administration group, they were able to put forth a request for proposals that attracted many new bidders, and ended up with significant savings. Friday (June 24), the Washington State Productivity Board recognized group with a Teamwork Incentive Program award. And, while the team could have been eligible for an award of up to $10,000 per person, they turned down this award and received $200 each. "It was part of the job," said Chris Christopher, director of Maintenance Operations. See Saturday's story in The Olympian. The Snow and Ice Materials Contract Team, based in Thurston County, includes Director of Maintenance Operations Chris Christopher, Maintenance Operations Branch Manager Monty Mills, Maintenance Operations Staff Superintendents Jay Wells and Jim Andersen, retired Contract Specialist Gary Smith, and Department of General Administration State Procurement Officer Robert Paulson Jr. The hardwood floor in my house doesn’t look that bad, but it creaks too much and is getting really worn out in places. I know from past experience with other projects in my old house that once I start making repairs, I need to dedicate all the time and resources I can to avoid living for months on end in a layer of constant dust and debris. So what do my house repairs have to do with your commute? All that construction work we’ve planned to fix northbound I-5 between Burlington and Lake Samish at the Whatcom County line is kind of like my house project. Once you start, you can’t turn back. And like my hardwood floor, we have 12 miles of I-5 pavement that’s cracking and wearing out, and in need of repair. Our pavement repairs go beyond just fixing the cracks; the repairs go to the very foundation of our interstate. We will be ripping out and replacing bridge approaches and concrete roadway panels and repairing bridge decks, among other projects. This work will be complex, time-consuming and must be done in sequence, which means drivers can expect around-the-clock lane closures for two weeks, Mondays through Fridays. If you plan to drive this stretch of northbound I-5 during the next few weeks, you’ll want to pay attention: Only one lane of northbound I-5 north of Burlington will be open next week from 7 p.m. Monday, June 20, through 10 a.m. Friday, June 24. You can expect delays of up to an hour or more during the afternoon commute, especially between 2 and 6 p.m. If you want to save yourself a lot of time and help us keep traffic moving, plan ahead and check when the best times are to travel through the project area, reschedule your trips, or take alternate routes. You can find more information on our project website. We need warm and dry weather for this work, so keep your fingers crossed for good weather. If all goes well, crews will complete the second five days worth of work starting on June 27. When this part of the work is done, the most inconvenient part of construction for travelers will be out of the way. In order to resurface the entire roadway and complete other repairs, crews will still be working overnight during the week and will need to close a lane. There’ll also be the occasional ramp and rest stop closures. When the project is done in the fall, the road will be smooth and as good as new. Make Yourself Visible – Follow the left tire track of the vehicle in front of you to avoid being hidden in their blind spots. Wear reflective clothing when possible and assume that other drivers don’t see you. Share the Road, Not the Lane – Never share another lane with a moving vehicle and never take a short cut between stopped or slow moving vehicles. Light Up – Keep your headlight on or use supplemental running lights at all times. Go with the Flow – Drive at the speed of traffic to make yourself more obvious to other vehicles. Treat Yellow Lights as Red Lights – Stop for yellows, don’t speed up. Motorcycles can be difficult to spot in an intersection. Know How to Stop – Periodically practice quick stops in empty parking lots, without sliding tires. Courses also are available to refresh motorcycle riding skills. Drive Defensively, Not Aggressively – Be respectful and courteous to other commuters. Avoiding antagonistic behaviors like stopping short, tailgating or cutting off drivers. Keep an Eye on Other Drivers – Anticipate a vehicle’s change in direction by watching the driver’s head movements, hand motions on the steering wheel or the changing direction of the vehicle’s front tires. Protect Yourself – Wear a helmets and protective clothing such as jackets, gloves, boots, and pants to minimize injuries in the event of an accident. Be Alert – Constantly look for road surface hazards, and at night, watch for sudden tail light movements of the vehicle in front of you as a warning of surface hazards ahead. For more biking best practices, check out our previous blog highlighting Motorcycle Safety Awareness Month in May. Motorcycling can be an excellent commuting alternative that offers both fuel efficiency and free hair drying services, not to mention the opportunity to enjoy the outdoors without the hindrance of being enclosed in a car. So if you choose to dust off your Harley and brave the elements on Monday morning, do what you can to make your ride as safe and secure as possible. Oh, and watch out for bugs in your teeth! Last week was National Tire Safety Week and the AAA Foundation wants to help you ensure that your vehicles are road trip-ready before embarking on any vacation adventures this summer. Tire safety is serious business, Secretary LaHood recently shared data that shows, from 2005 to 2009, nearly 3,400 people died--and an estimated 116,000 were injured--in tire-related crashes. However, proper tire care doesn’t take much effort and can help prevent breakdowns and blowouts during your summer travels. Unfortunately, knowing how to keep tires in tip-top condition isn’t necessarily common knowledge, according to a recent tire care awareness survey by the Rubber Manufacturers Association. More than half of drivers don’t know how to check if their tires are bald, only 15 percent properly check their tire inflation, and 62 percent don’t know where to find the correct inflation pressure for their vehicle. Here is a quick tire safety checklist, provided by the National Highway Traffic Safety Administration, to help ensure your next road trip is a blast instead of a blowout. Maintain proper tire pressure, particularly during hot weather. Find your vehicle’s correct tire pressure on a label on the driver side door or in the owner’s manual. Check tire pressure often (at least once a month), and don’t forget about the spare. Always check tire pressure when tires are “cold,” meaning they’ve not been driven on for at least three hours. Purchase a tire gauge and keep it in your vehicle. Make sure your tire valves have caps. Always check tire pressure before going on a long trip. Inspect tires for cracks, foreign objects, uneven wear and other signs of damage. Remove any items wedged in the tread. Check to see if your tires are bald using the Lincoln’s Head penny test: Place a penny in the tread with Lincoln’s head upside down and facing toward you—if you can see the top of Lincoln’s head above the tire tread, it’s time for new tires. Rotate your tires to help prevent uneven wear and increases their longevity. A good rule of thumb is to rotate your tires approximately every 5,000 miles (or every other oil change!). Have a tire dealer check your vehicle’s alignment periodically to avoid tire damage. Avoid running over potholes or hitting the curb while driving or parking, which can throw off your alignment. Summer. . . a time for shorts, tank tops, swim suits, and… ski boots?? For our avalanche technicians and maintenance crews, essential gear includes mountaineering skis, avalanche rescue gear, and down parkas regardless of the June date. Crews have been hard at work clearing Chinook Pass of its record snowfall since early April. But if they have been working since April, why is the pass still closed? 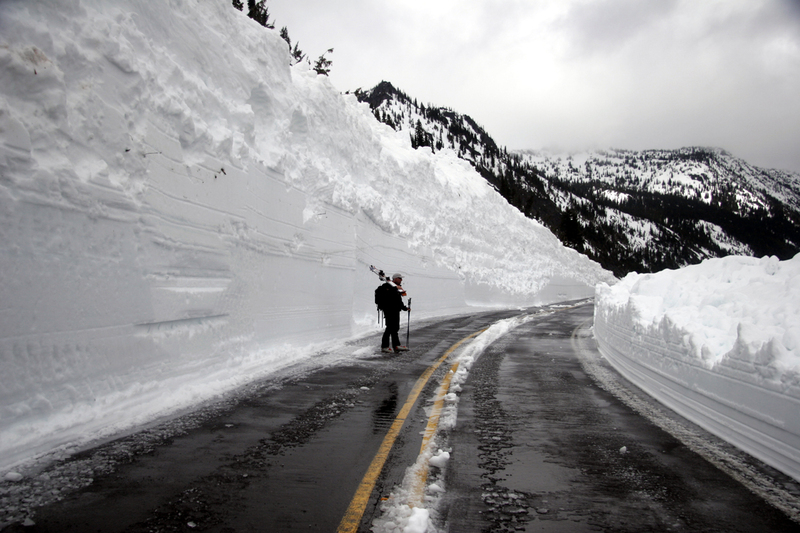 To begin with, snow has continued to fall on the pass, even into June, keeping SR 410 at the summit buried under 20 feet of snow. This new snow, combined with the warm summer temperatures that we all enjoy, made for some very unstable slopes. Both natural and controlled avalanches have left up to 20 feet of snow and debris on the roadway, and if the temperatures stay warm, more avalanches are likely. Our crews were busy for two weeks in May responding to emergency flooding damage around the Yakima Valley and had to be pulled off working on Chinook clearing. They have since cleared to the summit from the east, while crews working out of Greenwater (20 minutes east of Enumclaw), are clearing from the west. Equipment issues put crews behind schedule, but they are currently within two miles of the summit from the west. The two crews will continue until they meet, and then plow the full width of the roadway and repair or replace damaged signs, before Chinook Pass can be re-opened for the season. Most of the businesses along SR 410 rely heavily on visits from summer tourists. 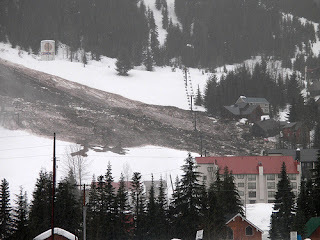 We are very much aware of this, and are working diligently to open Chinook Pass by the end of June. SR 410 is a scenic byway, considered one of the most beautiful in the United States. Lake Tipsoo, near the summit, is one of the most often photographed landscapes in our state. Many great hiking trails and camping grounds are found along the route. Highlights include traversing the Pacific Crest Trail, a four-mile loop around Naches Peak, a hike to Boulder Cave, camping near the Bumping Lake Recreation Area, and hiking on Skookum Flats Trail, to reach the 250-foot Skookum Falls. SR 410 is also the eastern entrance to Mt. Rainier National Park, the nation’s fifth established national park. As soon as we can safely re-open SR 410 over Chinook, travelers can once more enjoy the scenic drive and the great summer activities along the route. This morning, President Obama signed an executive order to establish a White House Rural Council, which would be the first of its kind to focus on policy initiatives for Rural Americans. In a statement posted to the White House Blog, U.S. Secretary of Agriculture Tom Vilsack, who chairs the Council, noted that this will provide an opportunity to focus on a number of critical issues, including upgrading and modernizing infrastructure in these areas. This is especially welcome news in light of the fact that rural roadways continue to pose numerous safety challenges. While the level of safety on the nation’s road network varies, rural roads often fall under the highest risk category. In fact, two-lane rural highways – many of which are characterized by narrow travel lanes, hairpin turns, limited sight distances, and abundant roadside hazards – see fatality rates double or triple those found on America’s safest roads, our Interstates. President Obama has already made large investments in infrastructure in rural America, but much more is needed. The AAA Foundation is proud to lead a major undertaking – the U.S. Road Assessment Program (usRAP) – to develop a systematic assessment of the nation’s road network. The project uses crash location and roadway data to create risk maps, wherein road segments are color-coded according to the level of relative risk they pose as indicated by measures like crash rate and density. In addition, road segments are evaluated for safety and assigned star ratings based on their design features. Star ratings look at roadway elements that impact the likelihood of crashes occurring and the level of protection afforded to road users in the event that a crash does happen. With many local agencies struggling under tight budgets and staffing shortages, collecting the data required to systematically prioritize roadway project investments can be extremely burdensome, yet without this data limited resources may not be targeted to the projects yielding the greatest safety benefits. What makes usRAP so innovative is that it can provide highway departments and transportation officials with the additional tools they need to make these allocations effectively. By limiting the highest risk category to 5 percent of roadway length, usRAP also helps States meet Federal obligations to report their 5 percent of roadway locations with the most urgent safety needs. Given that infrastructure upgrades do not occur overnight, many of the usRAP materials are presented in a “consumer-friendly” manner, with the goal being that the general public can access them in order to learn about the level of safety offered by the road networks they rely on every day. Given the dangers posed by many rural roadways and the lack of transportation alternatives in many rural communities, this may be a valuable – and lifesaving – public service to rural Americans looking to factor safety considerations into route choices. Secretary Vilsack stated that he will be communicating with Rural America to “ensure that every American is aware of the programs and services they can access.” We hope that state and local governments will take a closer look at usRAP in light of the Administration’s renewed commitment to Rural America and learn about the significant role it could play in shaping the future of the nation’s infrastructure by guiding investment decisions and always keeping safety the top priority. Each day, our traffic engineers monitor traffic through the 440 cameras perched high above Puget Sound roadways. They look for collisions, disabled vehicles, dangerous litter (like bumpers or hubcaps) that could cause collisions or other problems. They also watch traffic flow to determine when to activate systems like Smarter Highways on I-90 (we just activated these signs this week). Well, it was during a routine traffic check on I-90 when they found Mother Goose and her five goslings booking down the shoulder of I-90. Washington State Patrol spotted them too and herded (herded? guided?) them off at the next exit. Not only do we want them to make it through spring, but we also want to make sure they don’t wander in front of your car. Can you imagine how bad you’d feel if you hit one? Or the mess it would cause if you swerved to try not to hit it? As the weather warms, students everywhere have started counting down the days until summer vacation. These three months of freedom usually include graduations, parties, road trips, vacations and summer jobs, all of which mean more teenagers behind the wheel. In preparation for this season, AAA and the AAA Foundation would like to remind parents that safety doesn’t take a summer vacation. In fact, seven of the ten most deadly days occur during the summer months. Traffic-related crashes are still serving as the leading cause of death among teens in the United States and as we want both parents and teens to be aware of that heading into what many refer to as the “100 deadliest days” of summer. Teen drivers need to know that driving is a privilege and understand the responsibility that comes with it. To ensure you and your teens are properly prepared for the summer roadways, visit our teen driving website, which offers a variety of state-specific resources, such as tips and quizzes. Parents also can download a copy of AAA’s Parent-Teen Driving Agreement, which can help set realistic expectations and establish boundaries for teen drivers. Driving is a rite of passage that every teen dreams of and most parents dread. But a little preparation, trust and shared responsibility at the start will go a long way to instilling safe driving practices that will last a lifetime of summers, not to mention falls, winters and springs. High gas prices? Other economic factors? The weather? There are as many theories as vehicles on the road this Memorial Day weekend. (If you are wondering, those numbers are below). Whatever the question, the answer remains that travel was markedly mixed for Memorial Day 2011. While east-west travel showed a decrease, north-south travel over I-5 showed a bit of an increase. So what about those mountain pass backups, you may wonder. While travel may have been down, it was only slightly. Combined with traffic incidents, there were places where drivers experienced significant congestion. Both I-90 Snoqualmie Pass and US 2 Stevens Pass were busy Monday, while drivers who stuck to the I-5 corridor moving through with atypical ease. 181,000 vehicles traveled over Snoqualmie Pass (both directions) from Friday to Monday, a decrease of 6,000 vehicles or 3.2 percent. 55,000 traveled Friday, a decrease of 1.1 percent, with drivers traveling earlier, so the late-night buildup didn’t happen. 600 fewer vehicles traveled over the pass on Friday. About the same number of vehicles traveled over the pass Saturday. 2,300 fewer vehicles traveled over the pass Sunday. 50,000 traveled Monday, a decrease of 5.7 percent. Most of this decrease was in the early morning and late evening. Those noontime and early evening travelers were still met with the congestion and long waits we predicted. I-5, Olympia to Tacoma showed a slight increase of Memorial Day weekend traffic. 40,600 vehicles on I-5 between Olympia and Tacoma (both directions) from Friday to Monday, an increase of 16,500 vehicles or 4 percent. 3,100 more (2 percent) traveled on Friday. 4,700 more (4 percent) traveled on Saturday. 3,800 more (4 percent) traveled on Sunday. 4,900 more (5 percent) traveled on Monday. I-5, Bellingham to the U.S./Canadian border showed the most significant travel increase, with 133,000 vehicles on I-5 between Bellingham and the U.S./Canadian border (both directions) from Friday to Monday. This was an increase of 14,700 vehicles (or 11 percent) compared to 2010. 2,700 more (7 percent) traveled on Friday. 5,000 more (14 percent) traveled on Saturday. 4,200 more (13 percent) traveled on Sunday. 2,800 more (10 percent) traveled on Monday. US 2, Stevens Pass Again, while those stuck in Monday’s traffic backups may not believe it, only 34,500 vehicles on US 2 Stevens Pass (both directions) from Friday to Monday. This was a decrease of 1,000 vehicles (3 percent) compared to 2010.Travel patterns for the four days appear to be as forecast. 600 less (6 percent) traveled Friday. 300 less (4 percent) traveled Saturday. 400 less (5 percent) traveled Sunday. 350 more (3 percent) traveled Monday. The latest viral video sensation, courtesy of would-be good samaritan Sean Symons, demonstrates the all-too-common outcome of drunk, drowsy or distracted driving. However, attempting to film dangerous drivers from behind the wheel can be just as reckless. Pay Attention to the Entire Road – Being alert helps you identify and avoid dangers on the road. Monitor what’s going on in front, to the sides and behind you at all times while driving, paying particular attention to pedestrians, bicyclists and debris. Keep an eye on your rearview and side mirrors so you’re not caught off guard by a dangerous or speeding driver approaching you from behind. Avoid Tailgating – While it is tempting to get a closer look at a bad driver to determine exactly what you’re dealing with, tailgating often leads to a rear end accident. So, maintain the three-second interval between you and the vehicle you’re following. If you are the one being tailgated, move to another lane if possible, or slow down to encourage the driver to pass you. Don’t Rely on Other Drivers to Do the Right Thing – Your driving behavior is the only thing you can control on the road, so be sure to drive defensively behind the wheel and anticipate danger before it happens. Distance Yourself – Distance is a safe driver’s best friend against hazardous roadway scenarios, and the more distance the better. If you see someone driving erratically in front, next to or behind you, slow down to let them safely pass and change lanes if possible. Avoid speeding up, braking suddenly or abruptly changing lanes as that might exacerbate the situation. Call in the Professionals – When you see someone driving erratically, report them to the authorities. Their behavior endangers everyone on the road and police are trained to get them off the roads safely. That Said..Stay Off Your Phone Behind the Wheel – Ask a passenger to make the call, or make a mental note of the situation, location and license plate information of the vehicle in question and safely pull off to report it. Engaging in any form of distracted driving to report unsafe conditions only increases the risk of circumstances going from bad to worse. While taking videos leave a lasting impression of how damaging reckless driving can be, it’s not worth putting yourself in harm’s way to capture the action. A video won’t do anyone any good if the camera becomes part of the wreckage, so stay safe by steering clear of dangerous drivers and driving distraction-free.